Thank you for getting involved with the Trust! There are several ways in which you can support our work. Check out the links below to find out how you can help. Join Team Trust for the 2019 HomeWalk Walk/Run to End Homelessness! Staff, residents, volunteers, and supporters will walk as one at the 2019 United Way HomeWalk in Downtown LA! (The truly ambitious folks can run!) By showing up together we are telling communities that permanent supportive housing works, that it takes a community to break the cycle of homelessness, and it tells our neighbors experiencing homelessness that we will keep working until they have a forever home. Register here and type in “Skid Row Housing Trust” as your team. Information on a meet up spot and day of Trust events to follow. Thank you and see you there! You can find detailed sign up instructions here. As a nonprofit organization, we rely on contributions from individuals like you. Your support helps ensure the success of the Trust’s resident. All donations are tax deductible to the fullest extent of the law. If you would like to make an online donation to Skid Row Housing Trust, please click below to go to our donations page. Want to do even more? 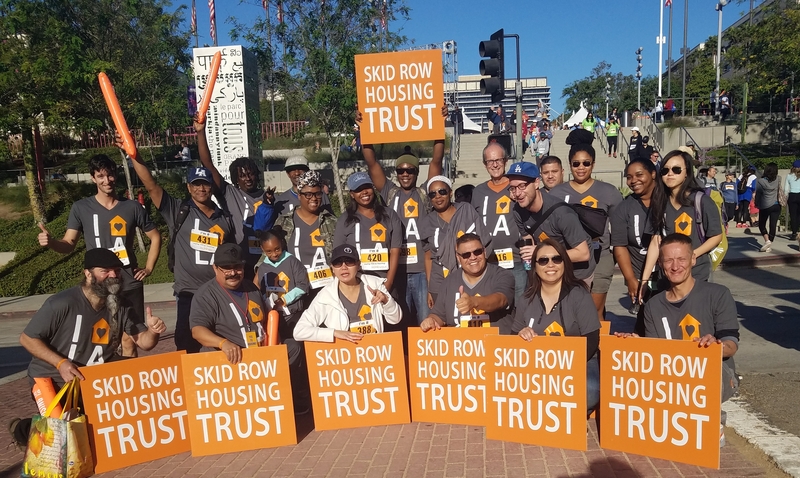 Create your own fundraising campaign for Skid Row Housing Trust! Go to Facebook. Click on the “Fundraisers” icon and select Skid Row Housing Trust. Share why you are fundraising, set your goal, and then invite your friends to donate to your fundraiser. Facebook changes its policy and does not charge anything for your donations. Win for both the Trust and you the donor! Volunteering with the Trust is an enriching and rewarding experience. Volunteers bring skills, knowledge and excitement, and can support our staff in providing the best possible services and experiences to our residents. Everyone has a place at the table when it comes to helping address and end homelessness. Are you an artist? Have artistic abilities from music to drawing to knitting? Check out some ideas for how you can engage, here. Do you own your own company or are part of a business and want to do an activity with your colleagues? Check out some ideas here and then connect with us! Want to work with us and directly be a part of ending homelessness? Click below for a listing of available job opportunities at the Trust.